You can get it all in, it’s just knowing your choices. The following two restaurant cafe’s each sit on some of the most prized, beautiful, famous real estate the world over. 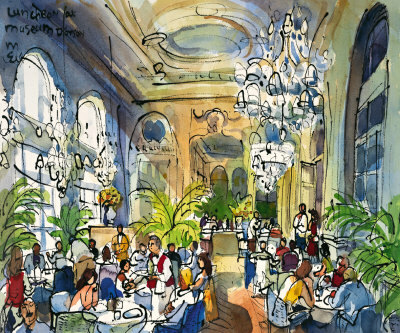 And though it might seem that they would be good for nothing than to see and be seen, each offers solid culinary choices that are sure to satisfy after taking in an afternoon of sites and national treasures. Of course everyone heads to the Louvre when they first visit Paris, but I’ve long found the Musée d’Orsay to be the star attraction and not just because the waiting time to get in is much shorter. The building itself is a masterwork of reclaimed urban heritage sites and shows French design aesthetic off to its best light. Artwork by Michael Leu. Le Temps d'une Pause, Musee d'Orsay, Paris. But after partaking of a full repast of Van Gogh, Gauguin and Toulouse-Lautrec, it’s easy to work up an appetite. 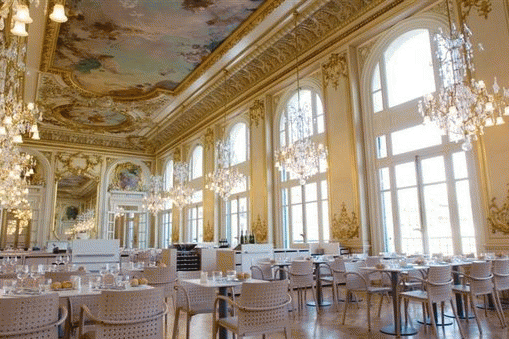 Le Restaurant Musée d’Orsay offers a Le Temps d’une Pause mid-afternoon light menu that perfectly hits the spot. It’s often misleading to think that museum cafes and restaurants will be overpriced. In the case of Restaurant Eliance (Le Restaurant) at the Musée d’Orsay, this isn’t at all the case. My total bill for a cup of carrot cream soup with a hint of orange and coriander served with a piece of carrot cake came to a total of 7 Euros. 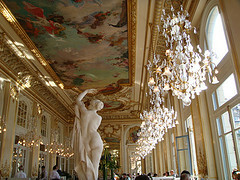 Le Restaurant at The Musee d'Orsay, Paris. Perfect place for a pause and a light repast. It was just perfect to take that “piqued” feeling away that can descend on you after you’ve overgorged on a few too many national-treasure-quality pieces of art in one sitting. Other choices on the menu included Marbled Terrine of Foie Gras and Chicken served with Fig Jam, a slice of aubergine and Tomato Confiture Garnish. I’m always a salmon fan and their Smoked Salmon tartine is served, in fact, on a pita bread, a change from the ubiquitous baguette, with a side of aioli; Twelve Euros. Also on offer is a Tartine Pôilane, or cured ham “sandwich” though of course their tartines/ sandwiches are openfaced. You have choices, too, if you want to go in the direction of sweet. They make an American-sized icecream sundae with whipped cream. You can also go for the Pastry selection and hot drink, which includes Max Havelaar – Fair Trade – coffee and teas. Their Spice Cake is a must try. It tastes especially delightful as you dine and take in the sweeping views of the Seine, of the Concorde, the portrait of Napoleon outdoors and the waving French Flag over the courtyard.